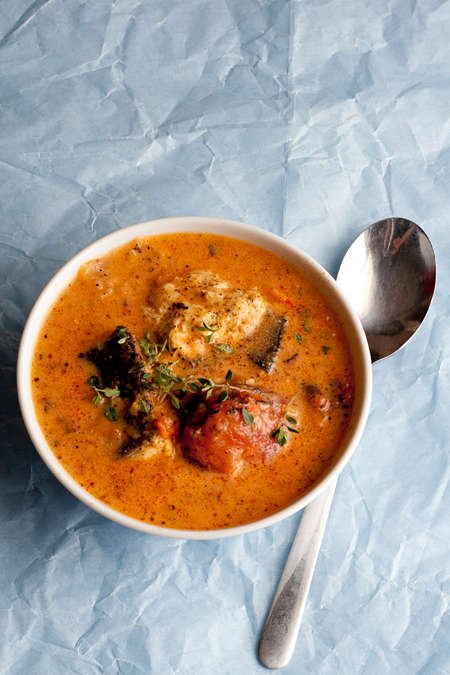 For this soup, I took inspiration from mtuza wa samaki, an incredibly spicy Kenyan fish dish with onions, tomatoes, vinegar and a bunch of Scotch bonnet peppers. I felt lazy about chopping things perfectly, so I am calling it "rustic." For the fish, I chose a sustainably-farmed Artic char. It stayed firm and didn't flake; I suggest leaving the skin on for maximum flavor. Roast the peppers until charred. Remove the seeds and puree with 1/2 of the tomatoes and one onion. Set aside. In a stockpot, saute the onions in the peanut oil until soft. Add the vegetable broth, other half of the tomatoes, coconut milk, Maggi cube, and sprigs of thyme. Bring to a gentle simmer. Add the hot pepper mixture bit by bit, tasting as you go until the desired level of heat is achieved. Salt and pepper to taste, and allow to simmer for about 10 more minutes. Add the fish, simmering gently for about 5 - 10 minutes until the fish is cooked. Serve garnished with fresh thyme. 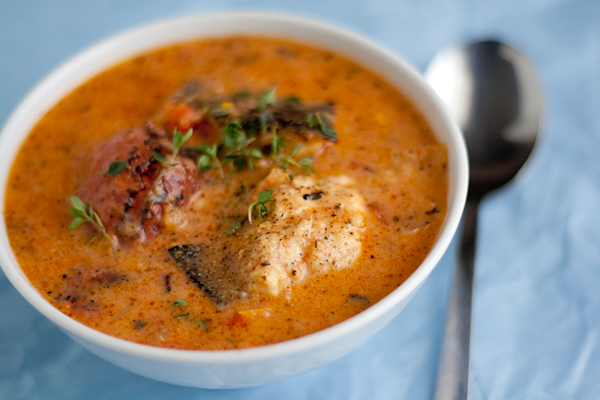 If you have leftover broth, you can re-heat it the next day and add more fresh fish. This soup has me written all over it. Lovely. Wow now that a bowl of great flavors in one soup! This has such a lovely color and look to it I wouldn't care what it tastes like. I may not be able to pronounce the dish that inspired it but wow, I wish I could have a bowl. Why don't you live closer to me? I wonder that very thing. It's a travesty that I don't! Wow, color me impressed. Gorgeous soup! What a handsome soup! I love the colour and how it looks smoky with the tiny bits of charred peppers (or at least that's what I'm assuming the little dots are). It does have a nice smokiness, you are right! Love this full depthful soup!! I love the color, the freshness, everything! Oh my God, I was hooked with just the title in my Google reader and can't wait to try this for myself. I'm still virtually tasting it. Thank you, so much, sharing. Come visit when you can. Your soup looks amazing! I'd love to try it! Do you have a suggestion about what I could use instead of the crawfish Maggi boullion cube? Thanks, Stephanie! I think you could either use a shrimp bouillon cube (Knorr makes them) or even a splash or 2 of Thai fish sauce. Just be careful of the salt levels if you go the fish sauce route. Ah, I wish! That is on the list for sure. Actually - next trip is Iceland!! Did you use Sweet Coconut Milk or just the regular? I just buy regular coconut milk, it hasn't been sweetened. This is definitely something I'd eat up. Anything spicy with coconut milk has got to be good! this soup contains all of my favorite ingredients..i cant wait to try some! what other kind of fish would go with this soup? Yammmm...! It remindes me on my trip five years ago in Kenya. Wonderful! 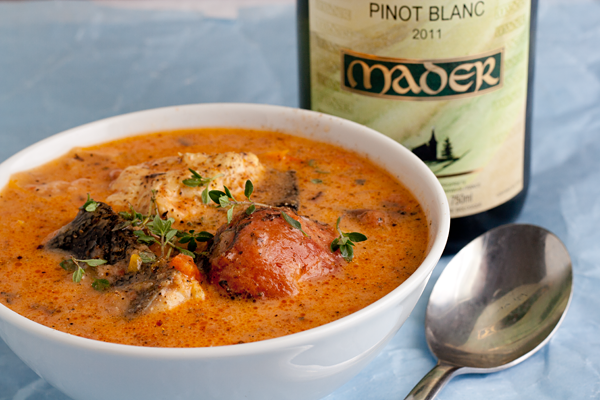 Hi Trix - Your soup is featured on With A Spin today. Feel free to share the link with your fans/readers if you think they'll benefit from daily Ramadan special recipe inspiration. Oh wow, that looks and sounds heavenly, especially now as the days are getting colder. I am icelandic and we love our Arctic charr. Fat and healthy. =) Thanks for the recipe! Just made this. Had some swai I needed to use asap. Googled ideas and found you. Thanks so much. Only thing I changed was the cube... Didn't have one but substituted chef prudhomme fish spice which worked well. Thanks so much. Hubby loved this so it's being added to the easy diner rotation for fall and winter! nice color, I love it. Thank you!